The Consolidated status of all Online applications submitted by the applicant including status of the Hard Copies submitted by the applicant against their Online Applications within the prescribed time in response to the Recruitment Notice against Post Category No. ER20317; ER20417; ER21017; ER21117; ER21217; ER21317 & ER21417 notified vide Advertisement Notice No. ER-02/2017 dated 24.08.2017 along with the STATUS of their candidature are given at Annexure-I for information. 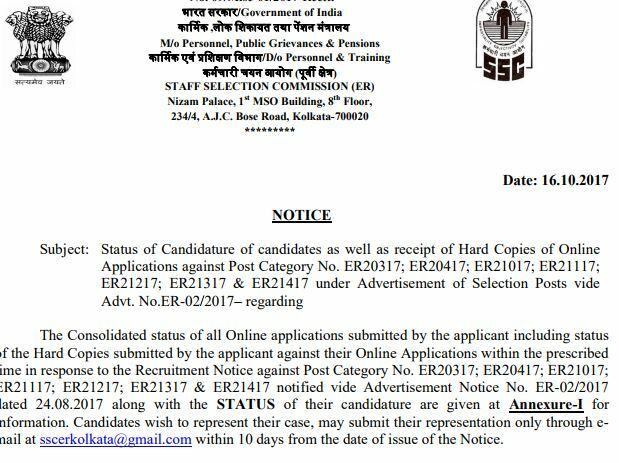 Candidates wish to represent their case, may submit their representation only through email at sscerkolkata@gmail.com within 10 days from the date of issue of the Notice.